Happy Labor Day to all of you! I hope you are enjoying your extended weekend as much as we did. I remember years ago, when I lived in Colorado, Labor Day was always the day I used as my gauge that summer was over. My mother’s cousin would always have a big family reunion in Canyon City over the Memorial Day weekend, which, for me marked the beginning of summer. These two holidays, Memorial Day and Labor Day, book-ended the summers for me. Our family reunions became a thing of the past when my mother’s cousin passed away. And, of course, as with a lot of things that are no longer available, I miss those reunions. I never really appreciated them as much as I should have. When my children were little, it really seemed like a big hassle to attend the reunion – knowing that we were going to have to keep our little ones occupied, worrying about nap time vs. cranky time, bring baby food, etc. Looking back, what was I thinking?!? Enjoy the moment! Getting back to my initial greeting: Happy Labor Day! I hope you all are having a restful, fun-in-the-sun type of day! Danna, September is my most favorite month of the whole year. When I was a very little girl, before I learned the order of the months I always believed that September was the start of the new year. I suppose this was because all the grown-ups around me talked about the new school year starting in September. I also believed Monday was the first day of the month. I suppose this was because the growns-ups would talk about the new work week. 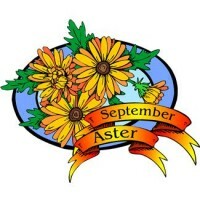 With all the new and different things that happen in September, this is why it is my favorite month. Being an avid sports fan, with the baseball playoff season heating up, the highschool college and pro football season starting and with school and college starting new years this is just an exciting time, for me any way. For several years I spent quite a bit of my after work hours going to see my grandchildren play football, soccer and volleyball as well as cross country. I went all over this part of Ohio to various schools watching their games. We used to travel all over the region to watch our highschool football team play. This was so much fun. Just to be outside watching their games was heaven to me!! The mums will be starting to bloom as will the other fall flowers. The new fall clothing fashions will be coming out. I love the new fall clothes the most. They are so colorful!! The new fall TV shows, hopefully some good ones, will be starting. A lot of the fall festivals will be going on each and every weekend until Christmas. There is just so much to do. The weather cools off some. Unless there is a hurricane like there is now, the humidity starts to go down. Classes for senior citizens will be starting at the YWCA. The tours for us leaf peepers will be starting. Hopefully the cold weather will hold off long enough so that I can spend more time sitting outside reading. The sky is a different shade of blue. The sun tends to cast a more golden shine to everything. The sunsets are beautiful. The clouds tend to be more white and cottony fluffy. People around here really decorate a lot for fall. Those colors in their decorations are very pretty. The birds seem to congregate more! Just a beautiful time of the year!! I suppose this is Mother Nature’s last time to show off for this year and around here she does a bangup job!! September is just an enjoyable month for me. I hope it is as enjoyable for some of you other people who respond to this forum as it is for me. Go Buckeyes! Go Bengals and Browns! Go Notre Dame and go my beloved Piqua Indians! Most of all Go Reds!! Linda, my husband and I are going to be going up to Colorado (and then hopefully Yellow Stone) pretty soon. I am so ready to see some fall colors! Memorial Day Do NOT WEAR WHITE CLOTHES BEFORE.LABOR DAY NO WHITE CLOTHES AFTER. That truly sounds absurd today. I love September Warm Days , Cool nights, and Morning mist on the lawn. It is the birth month of my only and favorite sister. Remember the song, “September Song”. First Day of school with a plaid dress and big plaid hair bow. (My mother loved plaid.) September is a bittersweet month for me. Regina, In my day ( I am 67) women weren’t suppose to wear white shoes or carry white purses until after Easter Sunday but then not at all after Labor Day. I seem to think Oprah always said the time was from Memorial Day to Labor Day. Danna, I hope you and all of us other cozy mystery friends had a wonderful and safe Labor Day! Hard to believe the next holiday we’ll be celebrating is Thanksgiving! Time flies. I just need to remember to get the most out of each day and even if it’s a really bad one, I’m blessed to have it. Hope all of ya’ll have a good day! Laurel, it’s hard to believe we are quickly coming to the holiday season. I, too often, forget to feel happy about every day, regardless of how the day is going. I’m going to try to take your sentiment with me! We spent labor day in Houston recovering from Hurricane Isaac. Did go to an amazing bookstore called Murder by the Book on Bissonnet. Anybody in Houston should check it out. Book signing this week by Susan Wittig Albert for the latest Darling Dahlia and the Confederate Rose. Great books, great staff. All of you who get to go to book signings are lucky. Except for some area authors, that just doesn’t happen around here. Oh my goodness, Nikki, what fun to have met Susan Wittig Albert! I just started to read ” The Darling Dahlias and the Confederate Rose” by Susan Wittig Albert.. I love this series because the storyline is set during the Great Depression and the tailend of Prohibition. I love to read the history of Americans, how they were able to endure during those hard times. For all the hard times a lot of people are going through now this series gives a lot of us hope that we too can and will survive!! and..I love the fall weather, and the fall leaves. With Halloween, Thanksgiving and Christmas right around the corner, this is my favorite time of year! I know, Melissa B, I just commented about how quickly the holidays are approaching. I have a few “seasonal” books on my Kindle queue, and am looking forward to reading them in a few weeks. Linda I do not know why we had such a fetish about wearing white. In Brookline MA where I grew up we were very traditional about it. Easter was the day we broke out our new spring clothes. It might have been cold and snowy but it was spring. We were Catholic and kept Lent very seriously and that first piece of candy on Easter tasted soooo good. I am 77 and these memories are precious. Regina, absence does make the heart grow fonder, doesn’t it? Regina, Aren’t we a silly bunch of people who allow some so called fashion experts to dictate what is “proper” to wear at any given time? It’s as if too many of us don’t have enough common sense on how to conduct our own lives. Talk about sheep following other sheep off a cliff! The blind leading the blind, I guess. Happy Labor Day to you, too, Danna. I moved to San Marcos, Texas(half way between Austin and San Antonio) 41 years ago when I was almost 11 from West Virginia. Unfortunantly, down here we are still in the dog days of summer. I still feel that it should be cooling off drastically now that Labor Day has come and gone. Hah! We can consider ourselves lucky (!) if we don’t break out of the 90s. Sometime about mid-October 80s are not unreasonable and with luck, we may get some cool fronts that actually register. Ever since July, I have been reassuring myself that everyday brings me 24 hours closer to October, which is true! Thank heavens for cozies to bring some distraction! As always, great website, Danna. I’m sure we all appreciate your hard work! My gosh, Marion, you’re literally right up the road from me, and probably even closer to Susan Wittig Albert! Marion, We just had a short summer storm go through our area and the temps have dropped quite a bit. It has been in the upper to low 80s and 90s all week. But this weekend the temps are only supposed to be in the upper 6os!! Big change! But we have also had some very high humidity that has triggered a migraine for me. The weather people said this was all caused by the hurricane that hit the gulf coast earlier this week. To me this is football weather and I am looking forward to the cooler, less humid weather. Good weekend to make some chili, put it in a crock pot, watch football and baseball and read!! Isn’t that amazing? Where are you? I go to the San Marcos Public LIbrary for most of my books. Fall is my favorite time of the year. I’ve been to Maine in October several times to feast on the red, gold, and green you see this time of year. Living in So. California we’ve planted Liquid Amber trees to try to duplicate the fall color. What usually happens is that the leave here turn around Christmas. I love your site, and have printed the authors I enjoy and mark what I’ve read so I know what I still need to order and been able to complete many series. I’ve even set up a 3 ring binder with alphabet dividers to keep them in. On this note I have a suggestion, develop a printable version for each author that does not include the extra items (alphabetical links on the left, cover pictures on the right). All the information you do give for each series is great. Susan, your trees sound beautiful, even though you don’t get to experience their colors until December.